Elberta “Birdie” L. Davis, 92, passed away at home in Goodyear, AZ, Thursday, April 1, 2010. 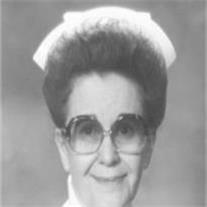 She was born November 14, 1917 in Denver, CO. She was a retired nurse. She was preceded in death by her husband, Cornell B. Davis, daughters Patricia Worrall and Sharla Rae Snyder, and grandsons Jon Rowlands and Tommy Worrall. She is survived by her son C. B. “Bing” Davis II, daughters Teri Ellis, Cheryl Tyler, Daunell “Dawn” Castleberry, Becky Page, Genae Heiner, 29 grandchildren, 88 great-grandchildren, and 2 great-great-grandchildren. She was sealed to her husband in the Salt Lake Temple. A viewing will be held on Wednesday, April 7th from 6-8 p.m. at Bunker’s Mortuary, 33 Centennial Way, Mesa, AZ. Burial will be at the Payson, UT cemetery on Saturday, April 10, 2010.